After launching mid-range and flagship devices, HMD Global-owned Nokia is gearing up to launch a new phone in the budget segment. The smartphone, dubbed as Nokia 2 is expected to be priced at $99, making it cheaper than the Nokia 3 which has been priced around $150. The Nokia 3 is available in India at Rs. 9,499, and the Nokia 2 may be launched around Rs. 6,499. The device is aimed at first time smartphone buyers and comes with decent specifications for a sub-$100 device. It is expected to be first launched in the US in Black and White color options. The Nokia 2 is expected to run on Android 7.1.1 Nougat with an assured update to Android 8.0 Oreo. 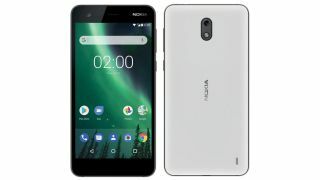 It is reported to feature a 5-inch HD display and come with on-screen navigation buttons, unlike other Nokia devices that were launched with capacitive touch buttons. In terms of performance, the Nokia 2 is expected to be powered by a 1.4GHz quad core Qualcomm Snapdragon 212 processor clubbed with 1GB RAM and 8GB of internal storage with microSD expansion option. The device is expected to come with an 8MP primary camera and a 5MP secondary camera. The Nokia 2 was recently listed on US online retailer B&H, with the model number TA-1035 which is the same model number that was spotted on a FCC listing. The online retailer had priced the device at $99 but the listing has been removed now. Being a budget device, the Nokia 2 will not come with a fingerprint sensor. It will come with dual SIM support and a huge 4,000mAh battery. The battery along with Snapdragon 212 processor should give the device a decent battery life. Apart from the Nokia 2, the company is also working on the Nokia 9, that is expected to come with an 18:9 display, Snapdragon 835 processor and dual Zeiss lenses on the front and back. While the Nokia 2 is expected to be launched in November, the Nokia 9 may arrive in January 2018.